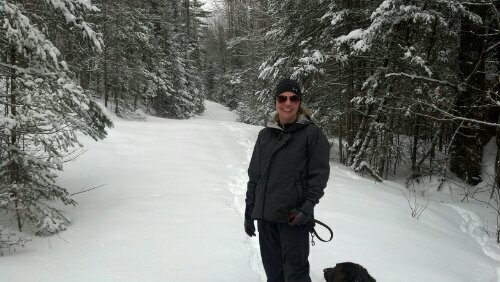 Today was a perfect day for snowshoeing! I was able to try out my new Under Armour Base 3.0 leggings and let’s just say I’m in love! I did wear a pair of Champion C9 active wear pants over them and I was perfectly comfortable. Gotta love Target! These are GREAT pants! They were not only light and comfy, but when I had to slide down a snow covered bluff on my rear end, I did not get wet or cold at all! Not to mention I wore these SmartWool socks for the first time, and they were perfect! Nice and cushy, and kept my feet dry and toasty all day! Yes, I’ve lived in the UP of Michigan my whole life, yet this is the first winter I’ve actually semi enjoyed. I love snowshoeing, but I love the fact that it is something the hubs and I can enjoy together, while getting out fitness on even more! 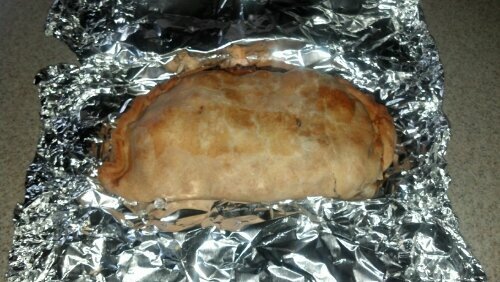 Pasty: The perfect Yooper lunch to come home to! What are some of your favorite winter activities and how do you stay warm? looking good, mauros! gotta get me some snowshoes next year. my favorite winter activities you ask? pretty much the same as my favorite summer activities – mucking stalls, cleaning paddocks, grooming horses… although i have the added pleasure of hauling 5-gallon buckets of warm water from the house to the barn and paddocks because johnny won’t drink cold water (and yes, it’s all about him!). so, my shoulders are looking pretty shapely, which is nice. 🙂 i’ve been trying to follow mr. kane’s diet, but sometimes a girl’s just gotta have a bowl of frosted flakes. i’ll work on losing weight this spring. if it ever arrives. I’ve never tried snow-shoeing before, but there have been several times this winter where I thought my commute to work would be infinitely easier if I owned some snow shoes! I wanna get some snowshoes. And Cross country skis.